It can be a joy and the foundation of a treasure trove of memories. Or it can be a recipe for disaster, if the timing isn't right, if the day is too stressful.... or if you're making a dish that's just too hard for little ones to particpate in. Cooking with your children as helpers (as opposed to ingredients, all you Hansel and Gretel fans) is a wonderful way to spend time together. A little planning -- and much flexibility -- will carry the day. The Idaho Potato Commission has some easy recipes that score on multiple levels. They're simple, they're tasty, they use ingredients children are familiar with. This is a mildly seasoned ketchup and is a great starter recipe for budding chefs. A combination of flavors that both kids and adults enjoy. Adults should help with cutting the scallions (clean, child-safe scissors are a fun way to do this job, too). 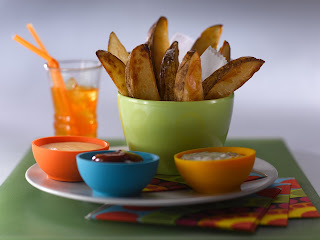 Perfect for dipping or making cheese fries, this sauce won't disappoint. Add grated cheeses and stir constantly until smooth. If necessary, heat at 10-second intervals, stirring in-between, until an even consistency is achieved. Approximate nutritional analysis per serving: 76 calories, 20 mg cholesterol, 95 mg sodium, 4 g protein, 6 g fat, 1 g carbohydrates.